Let me design and build a playhouse your children will love and play in for hours and hours . Do they like trains fire trucks, castles,toadstools, they can be custom built to suit your child . have you listed yourself on e-bay ? Jim built my grand daughter's a Delux Princess Playhouse and delivered it to Tokoroa for us today. The look on our grand daughter's face was so priceless. So thank you Jim for putting that big smile on the eldest grand daughter's face although her little sister will enjoy it when she is old enough. Highly recommend to any grandparents looking for that something special for your grand children. Sydney Whanau. Jim built a fabulous variation on his mushroom playhouse for us. We asked for a ponga themed house and it was beautifully realised, showing really clever creativity. We recommend his craftsmanship and service wholeheartedly. Most importantly, our three children love it and there is plenty of room for all three to play in it at the same time. Jim, The playhouse is absolutely stunning! You went over and above the call of duty, even delivering late on Christmas eve! thank you so much, I know tomorrow morning my kids are going to wake up so excited! Definitely worth every cent, and such a lovely guy to deal with. We are so thrilled with the pirate ship that Jim built and delivered to us in the Wairarapa. The ship itself is amazing - we have (so far) had up to 5 kids playing on it together quite comfortably. Jim's service is equally as good - he customised the paint to the colours we wanted and was very accomodating with the delivery. We absolutely recommend him and his playhouses. Thank you, Jim - we look forward to many years of imaginative play for our children and their friends! I just bought a playhouse for my nephew's first birthday. He might be a bit small for it now but I can imagine that there will be hours and hours of entertainment... Even his father loves it... Thanks very much. 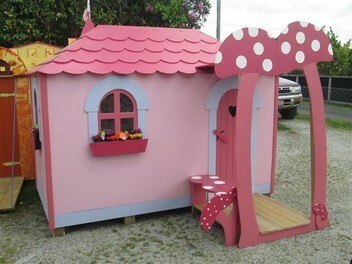 We bought a gorgeous mushroom playhouse for our 6 year old daughter for Christmas. It is absolutely stunning and her reaction on Christmas morning was priceless. Beautifully crafted and the cutest opening windows. I would highly recommend Jim's craftmanship and attention to detail!